(RxWiki News) The US Food and Drug Administration (FDA) and Federal Trade Commission (FTC) are taking action on electronic cigarette liquids that resemble kid-friendly food items. 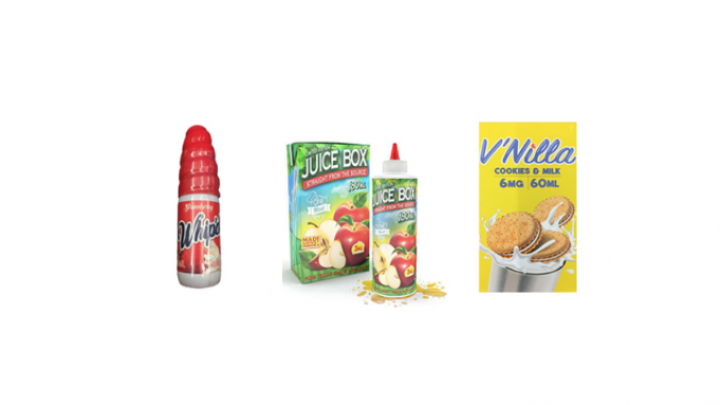 These agencies have issued 13 warning to letters to manufacturers, distributors, and retailers for selling e-liquids with labeling or advertising that make them look like juice boxes, candies or cookies. Some of these e-liquids feature cartoon-like imagery. Because these e-liquids imitate food items marketed toward children, the FDA has deemed them misbranded. This is because their labeling or advertising imitating kid-friendly foods is false or misleading, the FDA noted. These recent actions were part of ongoing efforts to protect youth from the dangers of using nicotine and tobacco products. "No child should be using any tobacco product, and no tobacco products should be marketed in a way that endangers kids — especially by using imagery that misleads them into thinking the products are things they’d eat or drink," said Dr. Scott Gottlieb, FDA commissioner, in a press release. "It is easy to see how a child could confuse these e-liquid products for something they believe they’ve consumed before — like a juice box. These are preventable accidents that have the potential to result in serious harm or even death." "One Mad Hit Juice Box” resembles children’s apple juice boxes, such as Tree Top-brand juice boxes. “Vape Heads Sour Smurf Sauce” resembles War Heads candy. “V'Nilla Cookies & Milk” resembles Nilla Wafer and Golden Oreo cookies. “Whip’d Strawberry” resembles Reddi-wip dairy whipped topping. “Twirly Pop” resembles a Unicorn Pop lollipop and is even shipped with one. E-cigarettes, often used with nicotine-containing liquids or “e-liquids,” have become increasingly popular. The FDA has linked this trend to an increase in calls to poison control centers and visits to emergency rooms related to nicotine exposure and e-liquid poisoning. Data from January 2012 to April 2017 showed a total of 8,269 exposures to e-cigs and liquid nicotine among children younger than 6. Children face a high risk from these incidents, the FDA noted. That's because even a small amount of nicotine exposure can lead to toxicity in children. Ask your health care provider any questions you have about nicotine products and nicotine addiction.